What should the City of Melbourne look like in the future? It has been valuable to attend two workshops for the advocacy sector on the NDIS in the last fortnight. 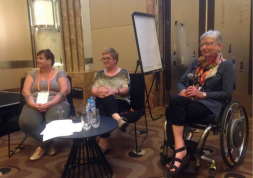 The workshops were run by Disability Advocacy Resource Centre and Disability Advocacy Network Australia and were a chance to catch up on some of the issues highlighted as NDIS is rolled out. For me, the discussions reinforced the reason why it's so important that advocacy, empowerment and representation of people with disabilities must be in the hands of people with disabilities. For example, the right of women to choose a female direct support worker is not a right that is currently upheld by many disability service providers. The result is that many women are forced to put up with male workers providing intimate care. They find this degrading and humiliating. In theory these women will have more choice under the NDIS - but in practice it isn't necessarily the case. That's why the NDIS must live by its principle and make sure they fund direct support separately to housing. This principle is recognised as best practice in the sector, but there is discussion in the field about NDIA are holding discussions about CRU style supported accommodation. This model won't provide choice about where you live, who you live with and from whom you receive personal care. This model is more of the same and there are many better examples of disability support and housing out there. That's why WDV is joining with other advocacy services to argue the case for the NDIS to do what it says it will do - control and choice for people with disabilities. The current severe shortage of affordable housing is compounded, for people with disabilities, by the absence of building regulations to realise a minimum universal design in all housing. That’s why we advocate to government to have a clear policy aligning affordable housing with universal design. I was very heartened by the Victorian Minister for Housing, Martin Foley, recognising the importance of integrating policies to address the most disadvantage populations in his presentation to the community sector last Friday. As we all know too well, it's an issue that's too important to ignore, and the time to fix it is now. WDV is looking for a Strategic Development Officer to maintain and grow WDV's position as a vital and influential voice for the rights of women with disabilities. The position is part-time (.7 EFT) and for a 12-month contract period. Further information see WDV's Employment Page. Applications close at 9am on Monday 28th March 2016. The Victorian Disability Advisory Council (VDAC) provides advice to the Minister for Community Services. Applications to join VDAC are now open. SCOPE Global are looking to recruit 4 officer roles and 1 team leader role to form the Disability Empowerment Skills Exchange team that will spend one month in Suva, Fiji, working with local girls and women with disabilities to help develop their leadership and communication skills. Applications are due by the 21st of March. For more information see SCOPE Global's website. See the WIRE Women's Information Referral Exchange website for details on how to get involved in their phone worker training. WIRE has scholarships for this training and provides a range of other opportunities. The next in our series of WDV Board Member Profiles is Saphron Hastie. Saphron is a Social Researcher (specialising in Women’s Subcultures) and a Higher Education Manager with a strong background in disability and student access. As a Kiwi, much of Saphron’s professional experience has been in NZ and the UK, having made Melbourne her home in 2011. 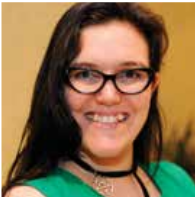 Saphron has been a passionate WDV Board Member since 2013, and she is a young woman living with specific learning disabilities and mental illness. We asked Saphron a few questions. What made you interested in joining the WDV board? 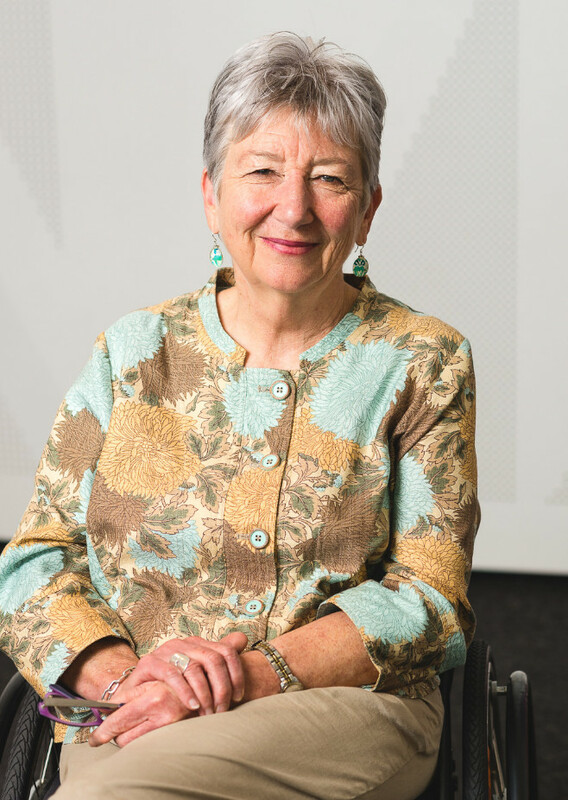 "I have a lot of governance experience from my various non-profit and educational leadership roles back home, in NZ. I wanted to keep that up when I got to Australia and WDV is the sort of organisation I am passionate about. Strategic leadership and board level governance can be incredibly rewarding both personally and professionally and it is something I think more strong minded young women should consider. On a more personal level I am a feminist and a woman with a disability, and an advocate in both my personal and professional life. It made sense to put my hand up when the opportunity arose. I’ve stuck around and kept putting my hand up because I feel like WDV makes a difference in our community, I love being part of that work and contributing at a strategic level to our already strong direction as an organisation." Is there a leader or role model that you admire? Who are they and why do you admire them? "I want to say our co-chairs Marjia and Ann-Marie or our ED Keran Howe, but I know that isn’t an exciting answer because we all know how great they are. So I’ll say Professor Rosalind Hursthouse, as well if not instead. Prof Hursthouse is one of those teachers who can’t help but leave an impression, not only is she an incredibly well respected academic, in a field which was never the most accommodating to women especially not when she entered it, but she also has a determination and a passion for her field, her students, and her profession which you can’t help but feel. She taught me theories of ethics in the classroom, but her example taught me to never be afraid of being the woman, the person, and the professional I want to be." What would you most like to change for women with disabilities? "To steal a perfect phrase: 'nothing about us without us'. Having our voices heard, respected and believed, is a crucial foundation for change and much needed progress in so many areas. It is an incredibly important message, and one that WDV is already championing in our work and by our example." What does the ideal day involve for you? "Good weather, my cat, my garden, and my spouse. Maybe some quality time with a good book – regardless of whether I’m writing it or reading it. I was going to ramble on about productivity and inspiring ideas or something, and while those are good things they’re not the ideal. My ideal day is a calm and relaxed one, following a much busier and more productive week." 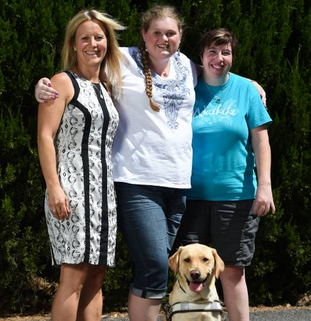 Women with Disabilities Victoria is partnering with organisations in Bendigo to deliver the Enabling Women Leadership Program in Bendigo in May and June this year. The program is an opportunity for women with disabilities from diverse backgrounds to come together. Women will share their lived experiences and support one another to achieve their goals. The program will run on Tuesdays from May 10th to June 7th. An information flyer and application form will be available on www.wdv.org.au from 21st March. PHOTO: Enabling Women participants from Barwon. The Boarder Mail writes about how WDV's 'leadership program for women with disabilities spurs change.' Enabling Women mentor, Tegan Allen spoke with the paper about how she has become a mentor for this year’s program, running for the first time in Wangaratta over April and May through Women’s Health Goulburn North East. PHOTO: Cynthia Brown of Milawa, Tegan Allen from Everton and Renee McCarthy of Yarrawonga will mentor women in the Enabling Women Program with WDV and Women's Health Goulburn North East. Keran took part in a Croakey #Periscope discussion with Deakin University’s Dr Patsie Frawley where the message was clear, research on violence against women must incorporate disability and culture. The conversation took place at the recent National Research Conference on Violence against Women and Children hosted by Australia’s National Research Organisation for Women’s Safety (ANROWS). Annie Blatchford reviewed the discussion in Croakey. The Disability Advocacy Resource Unit has uploaded a recording of their day forum on the NDIS which was held in February. The links follow. Q&A with the Office for Disability with Fleur Campbell. Have you been an involuntary patient, or on a compulsory treatment order in Victoria? If yes, research is underway to find out what resources you need to make decisions about your treatment, care and recovery. To find out more and to be involved contact Daniel Van der Pluym, Consumer Consultant at Independent Mental Health Advocacy, Melbourne, on Tuesdays and Wednesdays. t: (03) 9093 3715. 'Future Melbourne 2026' is a consultation on how Melbourne should be liveable and competitive over the coming decade. From February to 31 March 2016, City of Melbourne is asking community to share ideas for the city’s future in a range of face to face workshops, forums, seminars, and online. You can provide feedback on the vision and goals of the current community plan by taking the survey. Women's Health Victoria is holding an Applied Gender Analysis workshop for on Thursday April 14 from 9:30 to 3:30. This activity-based workshop is a step-by-step guide to performing a gender analysis in practice. It aims to equip professionals with skills in the design, delivery and evaluation of gender sensitive programs and services. The workshop will be in Melbourne and cost $95 (Full) or $50 (student/unemployed). Registration to Women's Health Victoria closes Friday 8 April. Contact Linden Deathe, phone 9664 9313B. and an Introduction to the Human Rights Charter. See the Commission's website for details. Women Enabled International have just completed a survey to find out what the priorities are for women with disabilities around the world. They heard from over 280 activists in 69 countries, spanning six continents – all working on behalf of women’s and girls’ disability rights, women’s rights and/or disability rights. strong policy making & advocacy for these issues. Diversity and Disability in partnership with Scope is setting up a Women’s Disability Support Group. Come along to the group to be empowered and talk about healthy relationships and rights. All women with a disability are welcome. This support group will run fortnightly on Tuesday mornings in Glenroy. For more information or to join the group, contact Christian Astourian on 9367 6044.